Join us for a new monthly weekend board game event in Fairfax! One of our members, Jennifer S., will be in charge of leading this event, which will take place every 4th Sunday of the month from 1-4pm at the 2nd Floor Café of Fairfax Wegmans (11620 Monument Dr., Fairfax, VA 22030). The event is free and open to the public. Jennifer notes that, “the motivation for creating this meetup is my ‘shelf of shame’, which is made up of board games that have sat unplayed (and sometimes unopened) for too long. For each event I will bring a game (or two) that I will play and teach with anyone who would like to join me.” Other attendees are also encouraged to bring games from home to the event to play and share! At the present time, this is only open gaming event we offer on a weekend day each month. It is also the only offer we have in Fairfax. 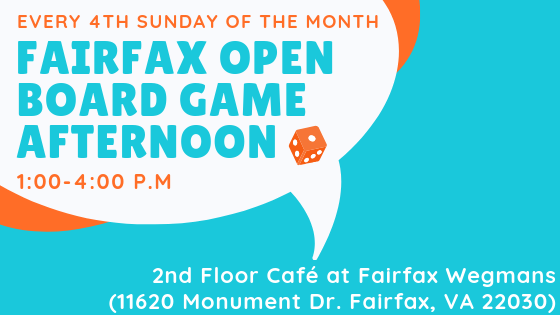 So, take advantage of this amazing opportunity for more gaming on the 4th Sunday of each month at the Fairfax Wegmans 2nd floor Cafe. Our website will continue to advertise these events and we will add them to our Google calendar. If you are not already on our mailing list, you can Sign Up on this website to get updated emails for every event we offer.